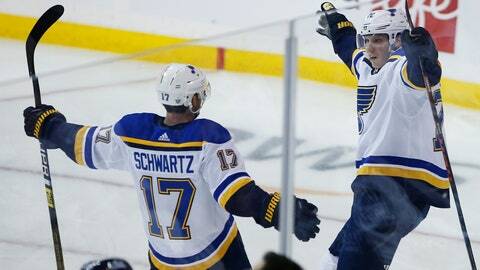 WINNIPEG, Manitoba (AP) — Sure, the Blues have a 2-0 series lead after road victories against the Jets. Pat Maroon and his St. Louis teammates refuse to feel anything close to satisfied. Oskar Sundqvist scored twice to lead the Blues to a 4-3 win Friday night in Game 2 of their Western Conference opening-round playoff series. Ryan O’Reilly also scored for the Blues, who host Game 3 on Sunday. Rookie Jordan Binnington made 26 saves. Blake Wheeler and Mark Scheifele each had a goal and one assist for the Jets, Patrik Laine also scored and Dustin Byfuglien had a pair of assists. Connor Hellebuyck stopped 28 shots. O’Reilly gave the Blues the 4-3 lead at 3:46 of the third when he used Jets defenseman Ben Chiarot as a screen to beat Hellebuyck on the blocker side. It was his first playoff goal since 2014, when he was with Colorado. The teams were tied at 1 after the first period, and at 3 following the second. The Jets went on the power play 3:58 into the first period after O’Reilly was called for tripping, but Scheifele took an interference penalty 1:03 into the man advantage. After Winnipeg defenseman Josh Morrissey bobbled the puck in the neutral zone, Sundqvist and Jay Bouwmeester capitalized on a 2-on-1 as Sundqvist beat Hellebuyck at 5:23. Scheifele was dinged for another interference penalty two minutes later. Then, with 17 seconds remaining in the penalty kill, Jets forward Andrew Copp was sent to the box for cross-checking. The Jets killed the penalties and Scheifele made up for it when he sent a pass from behind the net out to Wheeler for the captain’s goal at 12:01 to tie it at 1. But, St. Louis quieted the crowd by responding with goals by Maroon and Sundqvist to give St. Louis a 3-2 edge halfway through the second period. Scheifele tied it again with a power-play goal with 1:05 left in the second. NOTES: The Blues held a 23-14 margin in shots on goal after two periods. … Bortuzzo went to the dressing with a bleeding wrist midway through the third period, but returned. … Jets forward Mathieu Perreault left the morning skate early with an undisclosed injury and didn’t play, but winger Brandon Tanev returned after missing three games with a hand injury. The Blues look to take a 3-0 series lead when they host the Jets on Sunday night.